You can purchase the Clear Waves software alone or discounted when packaged with an RF Viewer USB wireless dongle. For evaluation purposes, feel free to download the Clear Waves software application. 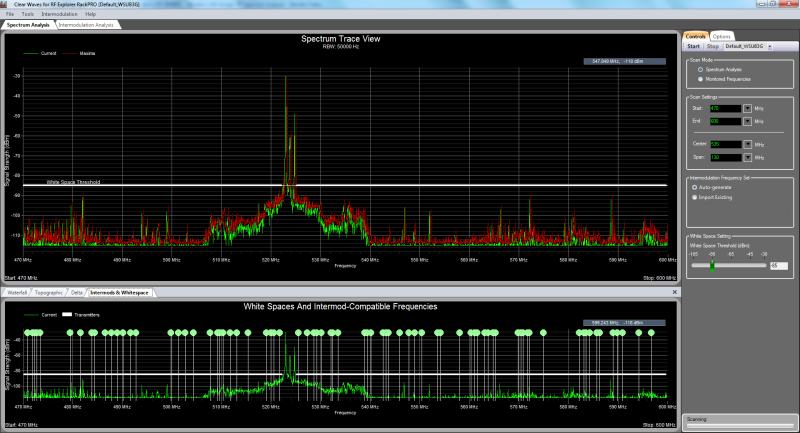 Without a wireless device the software still runs in a fully functional ‘Demo mode’ using simulated data. 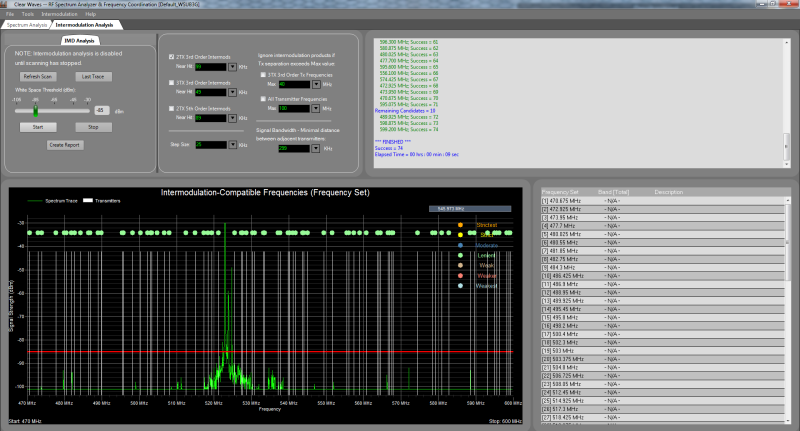 Using an RF Viewer spectrum analyzer for data acquisition, Clear Waves performs RF spectrum scans and intermodulation analysis in realtime, computing an intermod-compatbile frequency set after each spectrum trace. This feature is used for locating open frequency space in crowded RF environments or used to assist in properly spacing transmitters for frequency coordination. Using parameters that were set in the Control Panel a user specifies a signal strength to be used as the 'White Space Threshold', the minimum open space required for each transmitter (bandwidth), and the minimum spacing between adjacent transmitters (band-guard). The open spaces are then graphically displayed. It's designed perfect for locating open frequency space in crowded RF environments, or to help insure proper spacing for frequency coordination. The Intermodulation Distortion (IMD) module can also be applied to obtain optimal channel assignments for your wireless audio gear. 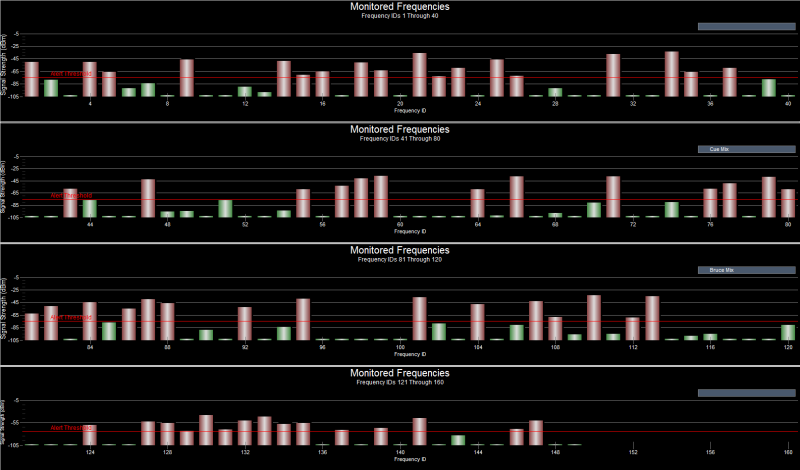 Clear Waves was designed with sound engineers in mind. The software and documentation included with Clear Waves allow even a novice user to get up to speed in no time and start making informed decisions about frequency coordination. Though many of its features are well suited for wireless professional audio production, Clear Waves is a sensitive and accurate, broadband RF spectrum analyzer that is an excellent tool for general commercial and industrial RF work where the goal is to monitor for RF interference and coordinate multiple wireless transmitters.